The Episode starts with Hayagreeva getting shocked seeing Vishnu having his head. He asks how did you get my avatar. Vishnu says I am Hayagreeva myself, and tells that he came to kill him. Vishnu says your Agyaan will take your life. You thought that you will not die because of Devi Aadi’s boon, but you will die soon. He kills Hayagreeva. Narad praises Vishnu. Devi Adhi comes there and says your Hayagreeva’s avatar will be idolized in the world. She makes him Vishnu again. Narad and others tell Jai ho..Betaal asks Vikram to tell the answer to his question and asks why Bhagwan Vishnu creates the circumstances so that Lakshmi cursed her. Vikram says nobody has the power to give him curse. He says only Lakshmi had the power to curse him. He says God Vishnu knows that he can kill Hayagreeva becoming Hayagreeva and that’s why made Devi Lakshmi cursed him. Betaal appreciates his answer and says you spoke and I will leave. Vikram shouts Betaal. He says you are scared and trying to scare me. He asks him to come infront. Betaal appears infront of him and asks are you a human or stone? Vikram asks him to come with him and says all your worries and problems will end. Betaal says if you like me so much then I will make your tree also here. Vikram says this betaal will be without Betaal log. Betaal asks until when you will be after me. Vikram says until I take you with me. He catches him. Betaal says you are chakravarti samrat and then does you trouble innocent me. He tells that today he will tell the story of a woman who has to bear the taunt of the world although she was innocent. 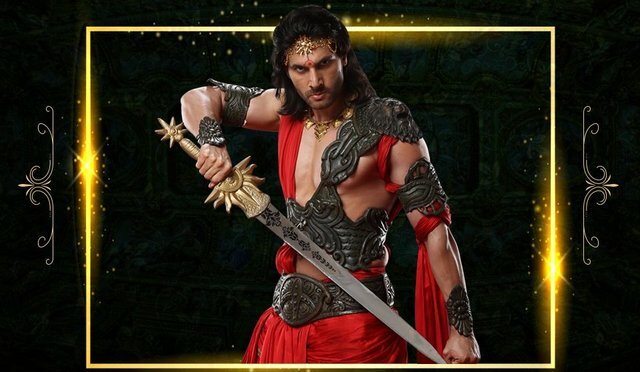 He says Devi Ahilya have to bear the taunt of the people for the crime which she had not done, and asks who was responsible for her injustice, her husband Rishi Gautam..or Dev Indra. He says this world knows the crime, but doesn’t know about the Adharm. He tells that today he is going to tell her story. He says Devi Ahilya was a princess before marrying Rishi Gautam and her life is dedicated to save women. A fb is shown, A headless man Narmundi demon walks towards the ladies in the jungle and tell that he will marry them. The ladies ask for help and asks him to leave her. Narmundi tells that he likes to see woman crying. Just then Devi Ahilya fires arrow on Narmundi and he dies. Devi Ahilya says whoever thinks of woman as the bhog, says she kills them. The ladies thank Devi Ahilya. Devi Ahilya asks her to take the weapon and save themselves. The lady says that they don’t know how to use Shastra. Devi Ahilya tells that men shall know that whom they stare, they can scratch those men. A lady comes there and cries complaining about her husband. They are called to the Palace. Devi Ahilya tells her King father tells the lady’s husband got remarried. Man says I can marry the number the times, I want. King says this is right, if he can take care of his wives well. Devi Ahilya asks who made this rule and tells that in olden days, when many people were killed and during those time, for the protection of women, this ritual was made that one man can marry many women. The man says this ritual is there even now. Devi Ahilya says you made this custom and says she will not let this injustice happen, as he didn’t remarry with his first wife’s permission. Man says this is not injustice. Devi Ahilya asks can your wife remarry some other man. Man says my wife can’t remarry any man even if I die. Devi Ahilya says why there is different rules of marriage for both and woman. She asks them to think how a woman might be feeling seeing her husband getting remarried. Raj guru says devi Ahilya is saying right. King announces only one marriage for a man in his Rajya. Everyone praises Devi Ahilya. Betaal says Devi Ahilya was like Maa Durga. A fb is shown, Devi Ahilya asks until when she will work for women development. Devi Ahilya says until all the problems end from the women life. She asks her mum to leave all her worries. Her mum tells that she wants to talk to her about something. Devi Ahilya says she will talk after puja and then comes to her mum and asks her to tell. Her mum tells that she wants to see her marriage. Devi Ahilya says it will happen when it is destined. Her mum tells that a man wants a woman who takes care of him and reserves herself to his family and not with the woman who fights for other’s rights. Devi Ahilya says she will marry the person who is suitable for her etc. Dev indra proposes marriage to Devi Ahilya. Devi Ahilya says you are characterless. Dev Indra says I will take you from here. Rishi Gautam comes there to stop Indra.